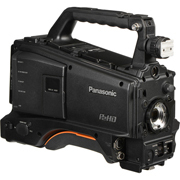 With advanced wireless and network functionality, the Panasonic AJ-PX380 P2 HD AVC-ULTRA Camcorder is a full-featured 1/3" ENG-style video camera with an interchangeable lens system. Please note that this item only includes the camera body and does not include the lens or viewfinder. Suitable for newsgathering, the camera captures Full HD at up to 59.94p, recording to optional micro P2 cards and supporting a P2 card slot. Using codecs in the AVC-ULTRA family allows you a choice of compression and data rate to suit your needs, and you can record proxy files on optional SD cards using the built-in SD media card slot.